First, you access your PageFly page in the Manage pages dashboard. Inside PageFly editor, you can find two buttons Save and Save & Publish. Save: this button will save the page on our PageFly server only. Save & Publish: this button will both save the page on our PageFly server and synchronize that data to your Shopify store. You should see the confirmation message below. To make sure the page is synced successfully to your store, navigate to Shopify Admin > Online Store > Pages. You should see the page created/published with PageFly. Note: To edit the page, you have to go back to PageFly Editor. 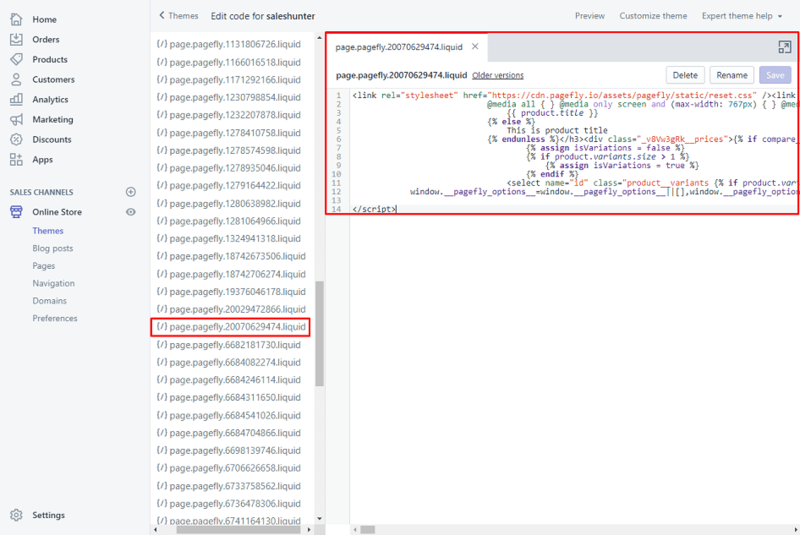 To find the source code of your PageFly page, you will need the unique ID generated from PageFly. First, access the PageFly page from Shopify Admin > Online Store > Pages. Here, you can see that it’s actually a page template with a unique ID in the URL (20070629474 in this example). Note: if you are looking for the template ID of your Home Page, it is index.liquid instead of a numeric ID. Next, you go to Shopify Admin > Online Store > Themes > your theme name > Action > Edit code. Then, use “Ctrl + F” to search for that unique page template ID. You’ll find the source code of the PageFly page in a blink. 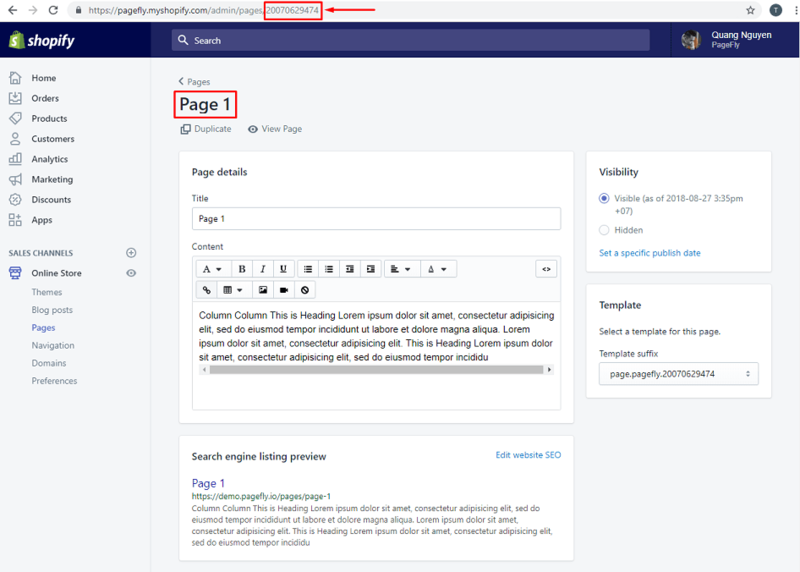 To have your PageFly page accessible on the Shopify menu, go to Shopify Admin > Online Stores > Navigation > select the menu you want to add the link to your PageFly page (we choose Main menu in this example). Next, click on the Add menu item button. You should give the item a unique name on the menu. In the Link field, type the name of your PageFly page then choose it and click the Add button. Now the “Example page” is linked to the main menu (in header). Here is the result on live page. Additionally, we have this video instruction ready for you.